In a Scottish Parliament debate on fairness for local television in Scotland, Stewart Stevenson, SNP MSP for Banffshire & Buchan Coast, praised the initiative for tapping into what people want. He praised local news coverage in the North-east, stating that the media industry in Scotland employs 3,500 people and that there is a great demand. “The North-east is well-served by its network of local newspapers and local radio stations with reporters embedded in the communities they serve. Stewart Stevenson, SNP MSP for Banffshire & Buchan Coast took a different approach when discussing the delivery of regeneration in Scotland in a parliamentary debate yesterday proposing that people evaluate community needs and the benefits of small projects. “Allowing regeneration projects to be on a smaller community scale generates creativity in solving the problem and reduces the size of failure when it occurs, thus encouraging further successes. Stewart Stevenson, SNP MSP for Banffshire & Buchan Coast is delighted that two local groups in his constituency will benefit from thousands of pounds worth of funding from the Awards for All Scotland grant scheme. Clerkhill School has received £10,000 which will be used to create a new agility playground in the school grounds that can be accessed by the whole community. Rosehearty Community Boat Club has also received a £8,711 grant from Awards for All which will increase the club’s capacity to provide sailing instruction for young people. The money will be used for materials to build a two more dinghies, equipment, training and a rigid inflatable boat (RIB) to be used as a rescue boat. “This is a fantastic result for two very worthwhile causes in my constituency. The award for Clerkhill School will transform the school grounds, and provide fun and entertainment for the whole of the community. Banffshire & Buchan Coast MSP Stewart Stevenson has welcomed new figures which show the benefits devolved management of the NHS and especially increased staffing for this vital public service. The figures show that since the SNP Scottish Government came to power there has been a 1,388 increase in Whole Time Equivalent (WTE) nursing and midwifery staff across the NHS in Scotland and the total figure now stands at 58,172. “It is right that we have delivered on our commitment to the NHS in Scotland which has allowed this record growth in nurses and midwives to be achieved. “The NHS in Scotland is recognised and valued as a vital Public Service and this Scottish Government will not allow damaging reforms to be introduced which will reverse these gains. Stewart Stevenson, SNP MSP for Banffshire & Buchan Coast, was delighted to show his support for new SIGN national guidelines on managing epilepsy in adults by signing a National Epilepsy Week ‘Gold Standard’ ticket at the Scottish Parliament. It is hoped the revised guidelines will change the lives of 50,000 adults nationally who live with the condition. “Over 500 of my constituents are adults who have epilepsy. I want the very best care to be available to them and their families whenever they need it. I will be raising with the local NHS board how they can do their best to ensure the latest SIGN guidelines are implemented. It will be helpful if we can meet this new gold standard in epilepsy care when it is launched after recess. 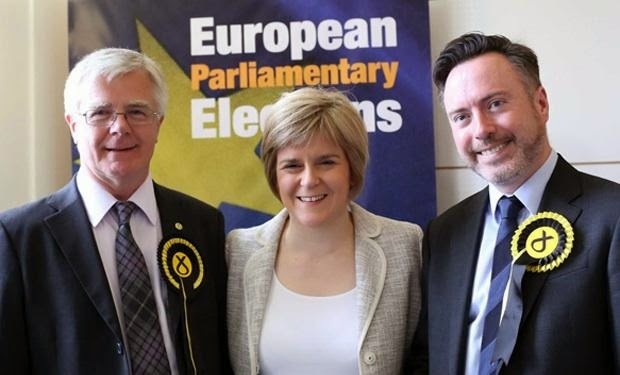 The final results of the European election have been described by Stewart Stevenson MSP as excellent both locally and nationally and a vote of confidence in the SNP Scottish Government. With the full results for Scotland declared, the SNP has won the election – increasing its votes by 68,496 compared with 2009 and securing 28.9 per cent of the popular vote. This is a bigger share of the vote than UKip achieved in the UK as a whole or in England, and a bigger share of the vote than Labour secured in Wales, where these parties topped the polls. The SNP came first in 16 of Scotland's 32 local authority areas including polling 31.3% in the Aberdeenshire Council area and 33.8% in the Moray Council area. “This victory for the SNP represents a vote of confidence in the Scottish Government and our priorities over these past seven years. What is clear from these results is that the people of Scotland have put their trust in the SNP in a way no other party has achieved in this election. The spectacular success of the Scottish Traditional Boat Festival in Portsoy was highlighted today [Thursday] in a Scottish Government debate by Stewart Stevenson, SNP MSP for Banffshire & Buchan Coast. To mark the national Homecoming 2014 celebrations Mr Stevenson praised the volunteers that have created a festival that over 21 years has grown from a few hundred visitors to tens of thousands worldwide. “For a community like Portsoy this is quite simply the best thing that will happen there. It is a talking point all the year round – the population multiplies by 20 and the media descends on Portsoy, which this year is like a Scotland in miniature. “It highlights the enthusiasm of the community and the energy of local volunteers who believe in their event. They give their time freely and generate a significant part of the £50m expected to be generated by this year’s Homecoming, sustaining economic viability for the area. “This is a world renowned event attracting people from every corner of the globe. The Scottish Traditional Boat Festival in Portsoy takes place from 27-29 June and includes a variety of cultural events including music from Celtic Connection award winners RURA, food and drink from the region including Portsoy’s Glenglassaugh malt whisky, sailing events and craft workshops. “I am pleased that the professionalism of prison staff has brought this incident to a satisfactory conclusion without the need for other services to be involved. They were aided by the modern design of the new prison which allows areas of difficulty to be closed down, maximising protection of staff and prisoners. “It’s disappointing that a number of prisoners are determined to ignore the significant opportunities to turn around their lives that the new prison offers. The incident involving 41 prisoners was brought to an end by staff at around 10.30am on Wednesday. Police Scotland have launched an investigation into the incident. HMP Grampian admitted its first inmates on March 3 after replacing HMP Peterhead and Craiginches. Stewart Stevenson, SNP MSP for Banffshire & Buchan Coast, has welcomed a new report highlighting that Scotland’s colleges are set to benefit the Scottish economy by over £1.2bn. Moray College in Elgin attracts many students from Banffshire and is one of the educational facilities mentioned in the report for its significant contribution. “Colleges across Scotland have an important part to play in boosting the Scottish economy – training over 235,000 students, employing more than 13,500 staff and contributing over £1.2bn to the economy by 2020. “The SNP in Government has worked to transform further education, strengthening the sector and ensuring students can access high quality training and skills provision across the country. As a result, more students than ever are ready for work when they leave - with a recent survey of employers finding leavers in Scotland the most prepared for work in the UK. “On top of this, recent Scottish Government figures have shown successes in the college sector, with even more course completions and record levels of learning hours benefiting students. “Despite unprecedented cuts being passed down to us from Westminster, college budgets in Scotland have been protected – with the current £522m funding floor higher than every year of the Labour/LibDem administration. The Economic Impact of Scotland’s Colleges report from Colleges Scotland [click to download, 1.2Mb], the body that represents Scotland’s further education sector, found that colleges will contribute £1.2bn to the Scottish economy. It also found that for every £1 invested in colleges, Scotland’s economy benefits by at least £3.20. Banffshire & Buchan Coast MSP Stewart Stevenson has welcomed the opening this week of a new dental surgery in Buckie as a major boost to local dental services provision. The move comes just weeks after new figures showed the number of dentists in Scotland has increased by almost 33 per cent since the SNP took office. Between September 2006 and September last year, Scotland has benefitted from 793 extra dentists - an increase of 32.6%. These extra dentists have helped to vastly increase the levels of registration with an NHS dentist. In March 2007 before the SNP took office, just 67% of children and 46% of adults were registered with an NHS dentist. The most recent figures show that as of 30th September 2013, 91% of children and 82% of adults were registered. Over 4.4 million people are now registered – an increase of 1.8 million since March 2007. “This is very good news for people in the Buckie area and I congratulate the owners and staff on this important new venture. 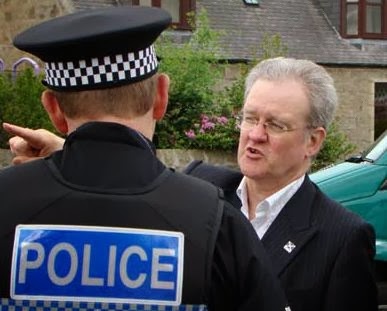 Banffshire & Buchan Coast MSP Stewart Stevenson has welcomed figures released today which shows that the SNP’s commitment when it took office in 2007 to 1,000 extra police officers continues to be exceeded. The latest quarterly strength statistics show that there were 17,244 police officers on March 31, 2014, an increase of 6.2 per cent or 1,010 officers since March 31, 2007. “I’m very pleased that the SNP Scottish Government is continuing to meet that important commitment to having 1000 extra police officers than when we took office. “For communities in the North-east this means a greater sense of well being and a much reduced risk of being a victim of criminal activity. “This Government has worked to protect police numbers and keep our streets safe and this has contributed to an almost 40 year low in recorded crime. “I am proud that we have continued to keep our commitment to put 1,000 additional officers in communities and extra officers are already being recruited ahead of the Commonwealth Games. “Meanwhile in England and Wales officer numbers are expected to drop by more than 15,000 in total with numbers now at their lowest level in 11 years. “We have always said that police numbers will fluctuate and this publication shows they are moving towards 1,000, continuing to exceed the target while keeping costs down. Alongside Police Scotland and the Scottish Police Authority, we are strongly committed to delivering 1,000 extra officers. “The creation of Police Scotland and the SPA has allowed local policing to prosper with officers dedicated solely to local policing in each Division supported by specialist services and the ability to allocate additional police officers in every area where and when they are needed." "While this is unfortunate, I am in no doubt that the professionalism of the prison staff will have meant this incident was brought to a satisfactory conclusion, as is evident by the fact that no-one was injured. "It's regrettable this has happened and regardless of the fact that the new prison is still bedding down, such incidents cannot be tolerated and I'm sure the prison authorities will be reviewing the matter to ensure the potential for further disruption is minimised."